Closet is a very personal space for all of us. It's place where we are all by ourselves and get ready to face the big bad world outside. As such, it is really very important that your closet is well organized so that you don't have any trouble finding the right dress or simply don't have to go through the stress of finding your favorite pair of jeans right at the start of your day. 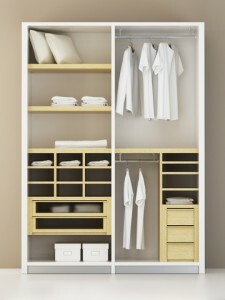 A well organized closet will surely give you a fresh and a smooth start to your day. Let's see how you can get yourself the perfect closet. The first and the basic move is to separate the clothes and footwear that you use from the items that you don't. You will be surprised to find items that you haven't used in years and it would obviously help you to save a lot of space. In case you haven't used an item from a year, it has to go. Also, don't cling on to clothes that don't fit. Yes, you might want to keep it for the time when you get back in shape but then again, at that time you'll surely deserve some new dresses. If the confusion still exists, you can simply start by marking your clothes. Remove the markings as and when you wear those clothes. At the end of a certain pre-decided period, if the item still manages to stay in the closet, it should go. Selling your more expensive but useless dresses to the nearby conventional store is never going to be a bad idea. Once you have taken all these steps, your closet will look a lot cleaner and a lot more spacious.